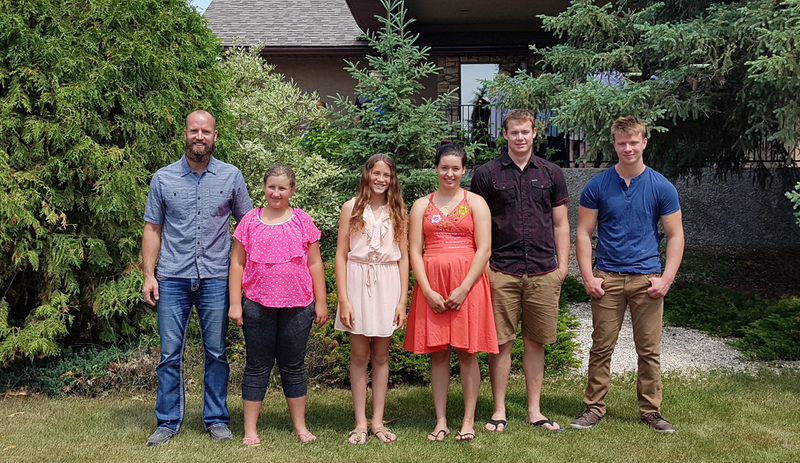 Baptized on June 24, 2018, were Cloe Derksen, Sienna Driedger, Kayla Klassen, Ruben Penner and Kenton Funk. Pastor Dylan Barkman stands with them. PANSY, Man.—Many things happen in a church. Sometimes God surprises us by adding to the mix even more then for which we might have bargained. On Sunday morning, July 1, a beloved daughter of the church suffered a heart attack in the middle of our prayer time. Amid qualified attendees quickly applying resuscitation, and countless tears and prayers all over the sanctuary, suddenly she started breathing again. By the time the professional emergency people arrived she was doing better, and, at the time of this writing, much better. Thank you, church. We don’t know why this happened, but we choose to thank God regardless. He is amazing. The Sunday before, on June 24, we were blessed by the baptism of five candidates. There is a wonderful spirit of joy watching the couple of hundred guests at the river site cheering on their loved ones who were taking this vital stand for their faith in Jesus Christ. May God give each of you his guidance, courage and joy in the days ahead! On June 17 we held our annual picnic. When you get to have perfect weather, no bugs, a best-all-around park, food and well-planned activities together in a happy crowd—can you think of a better way to spend a Sunday afternoon? To commemorate the re-paving of Pansy Road—something that was worked hard for and is much appreciated—we held a prayer walk early Sunday morning on the July 10. Each mile was walked along, in groups, as we prayed for the people travelling this road, for its longevity and special thanks to God Who alone made this possible. May highlights included a parent-child dedication service on June 13. Involved were Dorian and Chantelle Friesen with Hailey, Daniel and Kayla Goertzen with David, Jason and Brianne Preteau with Hazel, and Arvid and Manuella Zacharias with Gabriel. We pray for you all. May you have joy and wisdom for the parenting journey. On May 11 we hosted “Solitary Refinement,” the Voice of Martyrs Canada presenting incredible true stories from the persecuted church. It was eye opening to say the least. Before that we had had Compassion Canada, with a special speaker, Kiwi, telling her story. She had been a sponsored child and was now in a position to help us help others. A few weeks earlier we’d heard the story from Rob and Sharon Steeves about their amazing journey toward finding their three Ukrainian orphans who are orphans no more. Surely there are few things more worth talking about then our learning to hear and obey the voice of our Lord, whatever shape that takes.